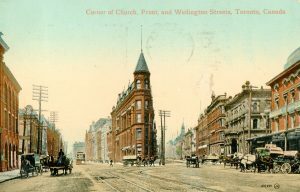 Corner of Church, Front and Wellington Streets, Toronto, Canada. Valentine & Sons, no. 109,221. Valentine & Sons of Dundee were Scotland’s most successful commercial photographers. In the early 1900s, at the height of the postcard craze, they published cards showing scenes from a number of countries, including the U.K., Canada, Australia, South Africa and the United States of America. Remembered today primarily as postcard publishers, Valentine & Sons actually produced images in various formats, including fine early photographic prints. In a 1905 advertisement, the company claimed to have produced “pictorial envelopes” over 60 years earlier (i.e. prior to 1845). The Dundee-based company had been founded in 1825 by John Valentine. After learning the daguerreotype process in Paris in the late 1840s, in 1851 Valentine’s son James added portrait photography to the family business. By the 1860s the company had begun to cater to the growing tourist industry by producing photographic prints with views from around the country. After James’s death in 1880, his son William Dobson Valentine took over the ever-expanding business. Valentine & Sons converted from a partnership of the family members to a joint-stock company in 1896, the year in which it is said to have issued its first postcard. By 1907 — according to an article in the Canadian Druggist, a trade publication — its factories in Dundee and Edinburgh employed 700 people and were turning out 3,000,000 postcards every week. 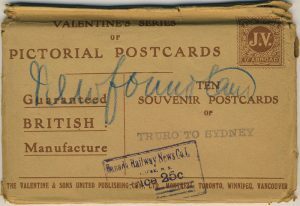 As early as 1904, the company advertised that its “Valentine’s Series” cards included “upwards of 50,000 Different Views representing every town and beautiful scene in Great Britain.” The operation continued until 1980 when the last remnants of the business were sold off to Hallmark, Inc.
A postcard packet. Lithographed postcards by Valentine & Sons and other publishers were often purchased in sets. 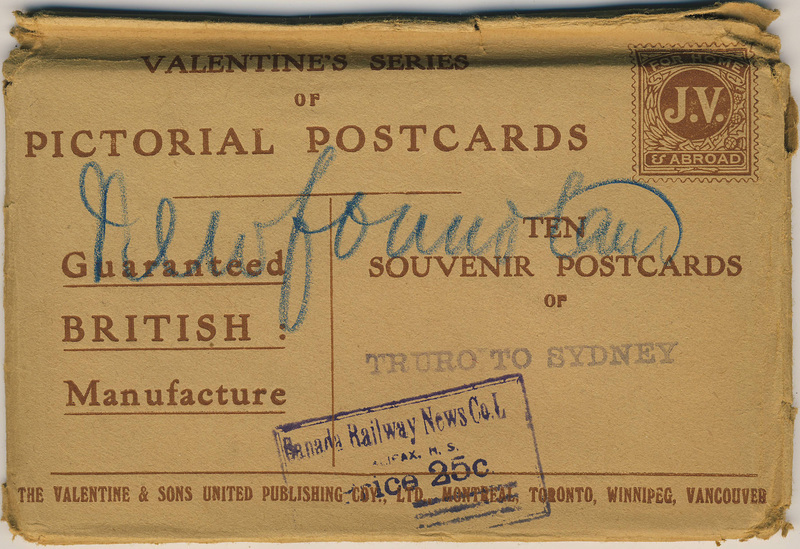 In this case, Valentine & Sons has packaged 10 cards showing scenes along the railway route from Truro to Sydney in Nova Scotia, for purchase aboard the train. The Canadian Railway News Co., whose stamp is visible on the envelope, sold the package aboard the train for 25 cents. 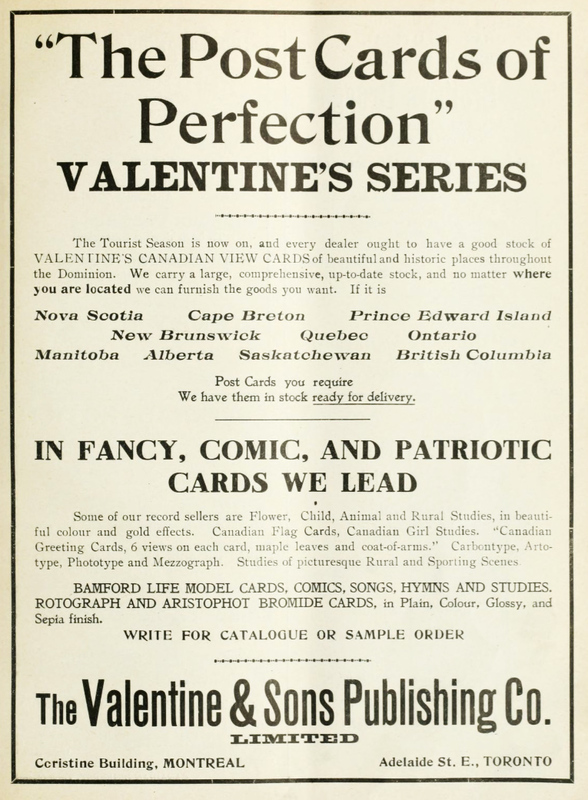 Valentine appealed to patriotic Canadian buyers by assuring them of “British Manufacture”, while most of its rivals sold cards printed in Germany. The firm’s Canadian business began between 1903 and 1906 when its Canadian subsidiary, Valentine & Sons Publishing Co., Ltd., opened in Montreal and Toronto. Montreal was the head office, staffed by a number of persons including George Clark, who had been sent from Scotland by the parent company to establish the operation. 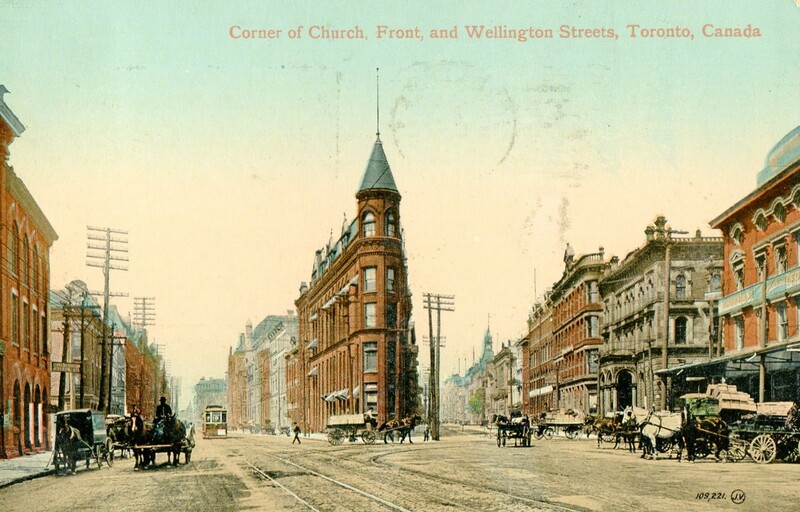 In 1908, at least, the Toronto office appears to have been small — a room at 69 Adelaide Street East and a handful of employees — possibly just an order-taking operation for its British parent (although it must have grown in subsequent years). In 1912, offices opened in Winnipeg and Vancouver. The earliest Canadian postcards published by Valentine & Sons were uncoloured collotypes of scenery along the main line of the Canadian Pacific Railway north of Lake Superior and in the Rocky Mountains. Typically, Valentine postcards have a 6-digit serial number (###,###) on the view side with the initials “J.V.” in a circle adjacent to that number. The main series of numbering begins with a Halifax card as no. 100,000 and ends (as far as we know) with a postcard of Toronto as no. 115,981. There are also two short runs of numbers in the 400,000 range that are found on some cards from the Yukon Territory and a longer run of views from various parts of Canada that begins at 600,000 and continues past 602,000. Other ranges belonged to Valentine & Sons’ branches in other countries, as follows: USA – 200,000s; Australia – 300,000s; and South Africa – 500,000s. 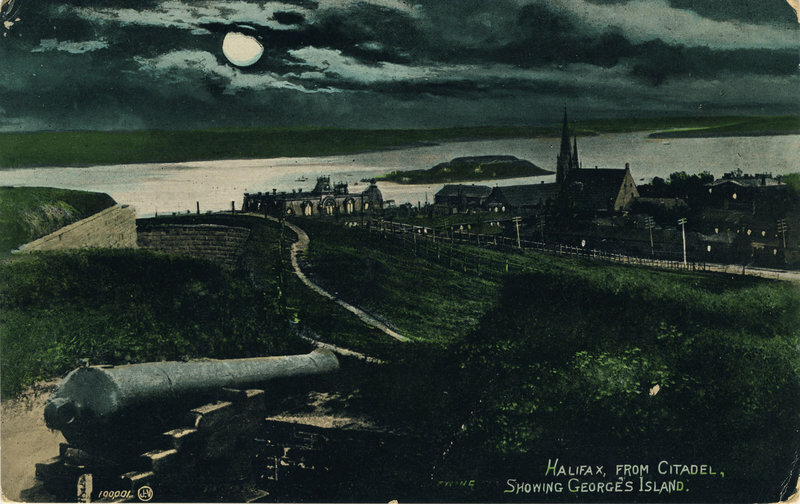 Valentine & Sons produced postcards of all Canadian provinces, although there were only a handful from Newfoundland & Labrador, which was not a part of Canada in that era. 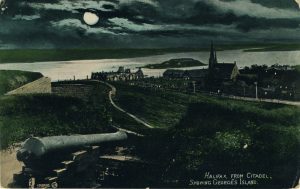 Halifax, from Citadel, Showing George’s Island. Valentine & Sons no. 100,001, the second postcard in the Canadian company’s principal numbered series. This version has been turned into a “moonlight” view by Valentine’s artists. Speaking very generally, the earlier Valentine & Sons cards — numbered from the 100,000s through the 105,000s — tend to be more common, while the later, higher, numbers are significantly more likely to be scarce. It is important to realize that the Valentine number refers to the image on the postcard and not to the card itself. In other words, if (for example) an image was published once, then re-published on a card with a different border design and then issued in a “moonlight” version (i.e. a card coloured to look as though the photo was taken at night, in the moonlight), all three of those cards will have the same Valentine number. That is one reason that it is unlikely that we will ever be able to say with certainty how many Canadian Valentine & Sons cards were printed. Even if we succeeded in associating all of the numbers in each of the sequences with an image, it would be nearly impossible (in the absence of company records) to know how many “variants” were produced from each of those images. Moreover, some Valentine postcards are unnumbered, e.g. the “multiviews” — essentially collages of multiple images — that the company produced in relatively large numbers. In 1909, George Clark, Percy McIntosh Black and a number of others in Montreal bought out the Canadian Valentine & Sons operation, incorporating it as the Valentine & Sons United Publishing Company, Limited. In 1926, the Canadian company split into two: the Toronto-based Valentine Black (under Percy Black) and the Winnipeg-based Valentine Edy (under J. C. Harrington Edy). The two companies continued to reproduce some of the existing images, but Valentine Edy, in particular, adopted new numbering systems in its later years. The Valentine Edy Co. ceased operations in 1957, followed by Valentine Black in 1964. The Vancouver office, it should be noted, existed only from 1912 to 1919, although E. P. Chandler, a photographic supplies dealer, had reportedly been the company’s original representative in British Columbia from around 1908 or 1909, according to an account in the Vancouver World newspaper in 1910. Valentine & Sons cards are by far the most common “Golden Age” postcards found in Canada. Because “familiarity breeds contempt”, these attractive cards are not always given the credit they deserve. Many of the cards are inexpensive, primarily because they are so common, but others are quite scarce and relatively valuable. 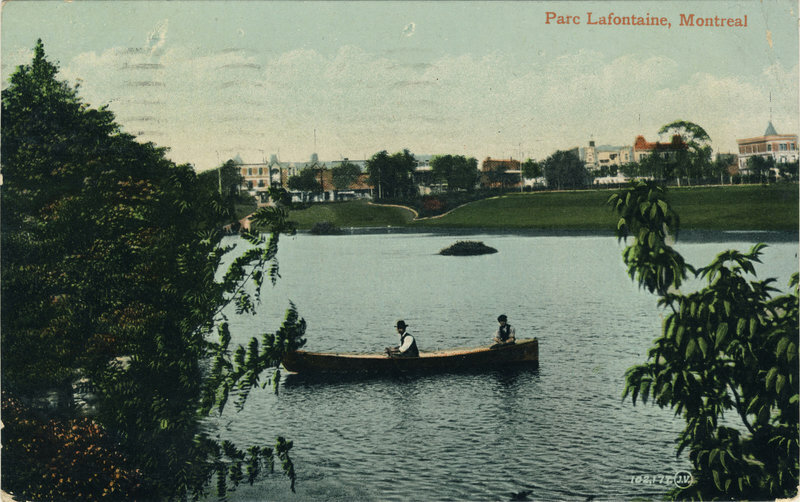 Thanks to the prolific production of Valentine & Sons, it is possible to assemble a sizeable collection of good-quality postcards from nearly any region of Canada quite inexpensively. The advertisement below, which appeared in the Canadian Druggist in 1907, gives a sense of Valentine & Sons’ strong position in the market and multitudinous offerings. 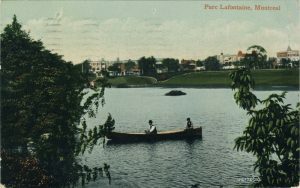 Parc Lafontaine, Montreal. Valentine & Sons no. 102,177. This illustrates the typography, colour palette and characteristic “look” of the most common type of Valentine & Sons postcard. Note the circled “J.V.” next to the number at lower right. Anyone who can supply more information for the list above is asked to contact us. *Thanks to TPC members Jack Cline and Ken Elder for dating information on the 108,000+ sequence, which seems to have been distributed beginning in the summer of 1912. A (+) indicates that the date given has recently (as of March 2019) been changed to reflect new information about earlier dates. Birds Eye View of Moose Jaw, Sask., looking North. Valentine & Sons, unnumbered. This is a rare bifold (two-panel) postcard by the company. Unusually, the photographer (Alfred Sutton) is identified in the caption. The most complete list of Valentine & Sons postcards is on our “lists” page. Click here for more information. Error: Error validating access token: Session has expired on Friday, 12-Apr-19 20:21:58 PDT. The current time is Friday, 19-Apr-19 21:33:52 PDT.